For the first time in Italy, a Fintech Festival is coming, it’s the FintechStage Festival, from 7 to 10 of May, with international speakers, at least one woman in each panel, all completely in English and itinerant. Three are the cities involved – Rome, Milan and Turin – and several topics will be addressed including Open Banking, Artificial Intelligence, Regtech, Insurtech, with a format open to the contribution of organizations, institutions, financial institutions, banks that have the possibility to organize their event. This “formula”, proposed to the country by FintechStage, aims to spread the knowledge of the world of Fintech and to understand how it is evolving and changing. It sounds familiar, because it is one of the main objectives of the Fintech District, born, as the coordinator Marco Scappa explains, with the aim of “creating a network of subjects operating in the most innovative finance sector that, collaborating, contribute to designing the future of the financial offer in order to grow the Italian entrepreneurial fabric by making the Italian market of Fintech known and competitive at international level “. Leafing through the program, you can touch the international nature of the initiative, entirely in agreement with the vision of the Fintech District, ecosystem partner of this event created in collaboration with Accenture and Deloitte as global partners, with Nexi and Neva Finventures of the Intesa group San Paolo as main sponsors, with Axa, Banca ICCREA – Ventis, Che Banca!, SwissRE, as a sponsor, Medici and Assofintech as supporters. “In order to compete on an international scale in the current context of dizzying technological progress, regulatory evolution and the paradigm shift of consumer behaviour, it is necessary to aggregate an ecosystem open to all market operators that foster collaboration inspired by open innovation models” explains Scappa emphasizing that participating in the Fintech Stage Festival in the role of Ecosystem Partner, “is a natural consequence, given the common goal of creating widespread awareness of the leading role that the Italian market can have”. 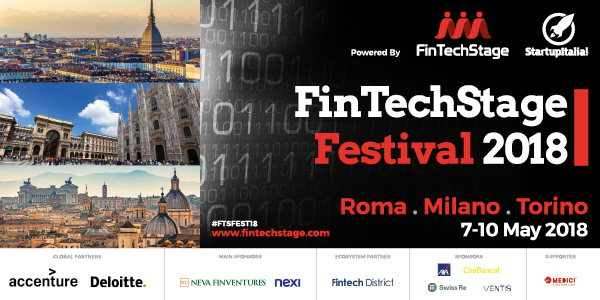 FinTechStage Festival 2018 starts in Rome (on 7 May), it moves to Milan (on 8-9 May), and the final event will be in Turin (on 10 May), always with the presence of Matteo Rizzi and Lazaro Campos (co-founder of FintechStage with Matteo and Mariela Atanassova) to which was added Bianca Lopes, former CIdO of Bioconnect and among the top influencers inserted by Forbes in his “Top 30 under 30” list. In the program, available on the FintechStage Festival website, there are many “vertical” events to explore the Fintech topics currently being discussed. On the opening day in Rome, a panel designed and organized by Accenture will be dedicated to Regtech, with regulators, institutions and startups for the first time present together to discuss this topic. Open Banking is at the centre of the event promoted by Deloitte and Fintech District, on the 8 of May, in Milan. In a live streaming between Deloitte GreenHouse and the Fintech District community, there will be a challenging debate on the role of banks between innovation and traditional services. During the FintechStage Festival there will be the chance to talk about Artificial Intelligence applied to finance and investments, and Insurtech, startups will have the opportunity to propose their application to the NEXI Startup Challenge while for investors, the appointment is in Turin: on the occasion of the presentation of NEVA Finventures, the Intesa San Paolo group investment fund, we will discuss new models of collaboration and investment. All events of the Festival are free after registration. To stay updated you can consult FintechStage Festival website, to participate in the open-banking event on the 8 of May at Copernico Isola for S32, sign you up here.